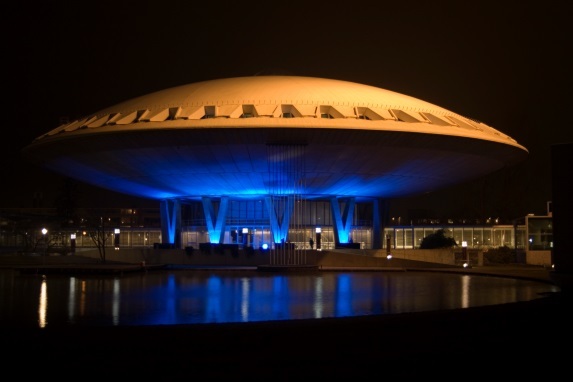 The conference venue of EDF2016 is the Evoluon in Eindhoven. The Evoluon Eindhoven is easily accessible, and located in the heart of Eindhoven, right next to the A2. Tilburg, Den Bosch & Venlo are less than half an hour by car, Utrecht, Maastricht and Rotterdam only about an hour. From the highway you directly drive onto our parking lot with over 500 free parking spaces, right on the edge of the center of Eindhoven. That means that the Eindhoven train station and Eindhoven Airport are less than 10 minutes away. Train travelers arrive from the Train station in less than 7 minutes, thanks to the bus stop right in front of the door. From Eindhoven Airport Eindhoven airport is located just five kilometers outside the city, and provides connections with major cities such as London and Paris. From Eindhoven Airport a regular bus connection (Line 401) takes you to the Evoluon in less than 15 minutes. There is also a direct airport shuttle between the trainstation and the airport. Tickets can be bought at the airport bus stand. A one-way train ticket costs € 19,40. From Eindhoven Central station busses go to the Evoluon, detailed directions can be found under ‘by bus’. A one-way train ticket costs € 17,50. Düsseldorf Airport is also an option and public transport connections are available but no direct and convenient connection exists. Eindhoven is easy reachable via Eindhoven Central Station. Please plan you journey on ns.nl. Evoluon is easily reachable by public transport. We therefore heartily encourage the use of public transport. Evoluon Eindhoven station is 7 minutes by bus. For all lines applies: get off at stop Evoluon. A bus leaves on average every 10 minutes from Eindhoven central. Make use of the public transport planner OV9292 for the best travel advice. The Evoluon has sufficient free parking space. Please follow the directions from the parking attendants! On junction Batadorp you take the A2/E25/N2 direction Airport/Veldhoven/Waalre. Attention !! Keep right on time to follow the N2. After some kilometres move over to the outside lane sign-posted: Centrum/Strijp. Take the first exit (nr. 30; Strijp). Turn left at the end of the exit and immediately after the fly-over turn right at the first traffic lights, where you will find the entrance to the Evoluon. On junction Leenderheide you follow the A2/A67/E25/E34/N2 direction Tilburg and ‘s-Hertogenbosch. Attention !! Keep right on time. On junction de Hogt follow direction Veldhoven, the N2. Take exit Veldhoven, de Hurk (nr. 31) and turn left on at the end of the exit. Turn right at the first traffic lights to the Noord Brabantlaan. Follow this road, turn right after the fly-over on to the Evoluon parking. On junction De Hogt follow the A2/E25 direction Tilburg and ‘s-Hertogenbosch. Take exit Veldhoven, de Hurk (nr. 31) and turn left on at the end of the exit. Turn right at the first traffic lights to teh Noord Brabantlaan. Follow this road, turn right after the fly-over on to the Evoluon parking. Please use the contact form below to email the EDF2016 team.